Dandruff is a chronic condition that causes itching and flaking of the scalp. The Mayo Clinic states that it is not contagious and rarely indicates a serious medical problem. Hormonal changes, certain fungal infections, and general illness are possible causes of dandruff, according to Milton S. Hershey Medical Center. While dandruff itself is not associated with hair loss, certain underlying medical conditions, such as psoriasis, may cause hair loss. Most cases of dandruff are easily controlled with proper scalp care and lifestyle changes. Severe cases may require professional attention and prescription medications. Use an over-the-counter medicated shampoo containing zinc pyrithione, tar, salicylic acid, selenium sulfide or ketoconazole. The Mayo Clinic recommends using a medicated shampoo daily until symptoms improve, and then reducing the frequency to two or three times each week. Alternating between active ingredients and leaving the shampoo on your scalp for at least five minutes is also beneficial. Try a prescription-strength shampoo, cream, or topical steroid if your dandruff fails to respond to daily shampooing with an over-the-counter product. According to the New Zealand Dermatological Society, prescription medication may also be necessary to reduce scaling and prevent hair loss in cases of dandruff related to scalp psoriasis. Add a few drops of tea tree oil to your shampoo. Tea tree oil has antiseptic, antibiotic and antifungal properties, and may help relieve dandruff caused by fungal infections. The Mayo Clinic states that 5 percent tea tree oil is generally well tolerated and may be effective against mild to moderate dandruff. Massage your scalp while in the shower to help loosen flakes and make them easier to wash away. Massage will also stimulate your scalp and improve circulation. 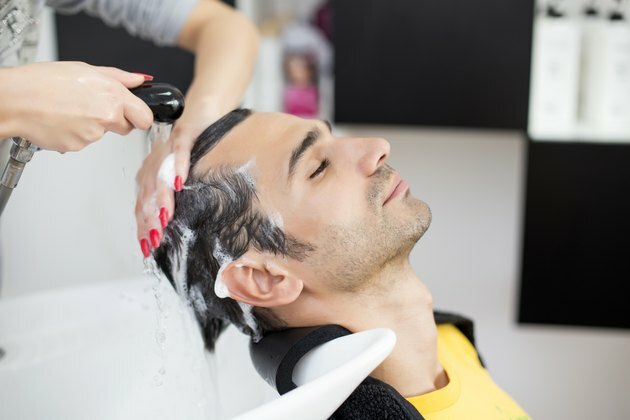 The Palo Alto Medical Foundation warns that massaging too vigorously may damage your scalp. Reduce the stress in your life by learning healthy ways to cope and avoiding or eliminating triggers. The Mayo Clinic states that stress can both trigger and worsen dandruff. Eat a diet high in B-vitamins, zinc, and omega-3 fatty acids. According to the Mayo Clinic, these nutrients are beneficial to scalp health and may help improve dandruff and prevent hair loss. When scaling and redness accompany dandruff, especially when skin elsewhere on the body is affected, a condition called seborrheic dermatitis may be present. Seborrheic dermatitis is most common in people suffering from nerve disorders and in those recovering from stressful medical conditions, according to the American Academy of Dermatology. Spending a few minutes outside in the sun each day may help cure dandruff, according to the Mayo Clinic. Tar-based dandruff shampoos may stain light hair.